This week 35 years ago, on 17 January 1972, seven republican internees escaped from the British prison ship, HMS Maidstone, moored at the coal wharf in Belfast docks, and swam to freedom. They achieved fame in news headlines across the world as ‘The Magnificent Seven’. Originally a Royal Navy submarine depot ship, the Maidstone was used as an emergency billet for British troops. After the introduction of internment, though, of the original 226 people detained, 122 were held in the Maidstone in the most cramped and inhumane of conditions where opportunities for even the most basic of needs such as exercise were virtually non-existent. Gerry Adams was held there for a brief time. Some of the internees had been planning an escape and the transfer of 50 internees to the new internment camp at Magilligan the day before meant they had to urgently push forward their plan. The men — Jim Bryson, Tommy Tolan, Thomas Kane, Martin Taylor, Tommy Gorman, Peter Rodgers and Seán Convery — had noticed a seal swimming through the ring of barbed wire which surrounded the ship. The prisoners reasoned that the gap was also sufficient to allow a human through. They had also been tossing tin cans overboard to monitor the movements of the tide. On the night of 16 January, the conditions were judged right and the escape bid was ready to go. The nervous tension was exacerbated by a late head-count of internees by guards, causing an unexpected delay of 20 minutes which was to almost scupper the escape’s success. The head-count over, the escape went ahead behind schedule. In a scene reminiscent of a Second World War POW movie, the men camouflaged themselves with boot polish and covered themselves in butter to insulate themselves from the cold waters they would have to swim through if they were to make it to freedom. Cutting through a steel bar in a porthole, they clambered down the ship’s steel cable. It took them 20 minutes to swim through the bitingly cold water. Several of the men who couldn’t swim had to be helped by their comrades. Despite this, and serious injuries inflicted by the barbed wire, all seven men made it ashore otherwise unscathed. The problem was that they had landed 500 yards down from the agreed rendezvous point with units of the IRA’s Belfast Brigade, waiting to take them to safe houses. 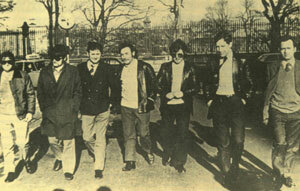 By the time the escapees had made it to the original meeting point, their comrades had left, believing that the non-appearance of the Maidstone men meant that the escape had been aborted. This forced the escapees, cold and dripping wet, to improvise. They commandeered a bus at Queens Road Terminus and drove across the city themselves. Peter Rodgers (clad only in his underpants!) approached a bus driver and asked him for a loan of his overcoat, explaining to the somewhat startled driver, and in something approaching the truth, that he had fallen in to the water. The driver handed over his coat and then set off on his route. On his return at 6.30pm he left the bus. The seven men clambered aboard. Rodgers, who had been a bus driver himself, took the wheel and off they sped. Reaction from the security men at the main gate was minimal, which is probably explainable by the fact that it was not every day they were confronted by the spectacle of a bus full of semi-naked men speeding out the gates. During the journey they were spotted by a British Army patrol but upon entering the staunchly republican area of the Markets the patrol refused to follow them any further for fear of an ambush. Before British troops could surround the area, the men had been spirited away to different parts of Belfast and the British search was in vain. Hours later, sitting in a drinking club, the escapees were much amused – as indeed were most of the country – by the appearance of one Colonel Tony Budd of the Royal Horse Artillery appearing on the TV news to assure them that all was in order. But everything wasn’t in order – the Magnificent Seven were out. The Magnificent Seven escaped from the British prison ship, HMS Maidstone 35 years ago.